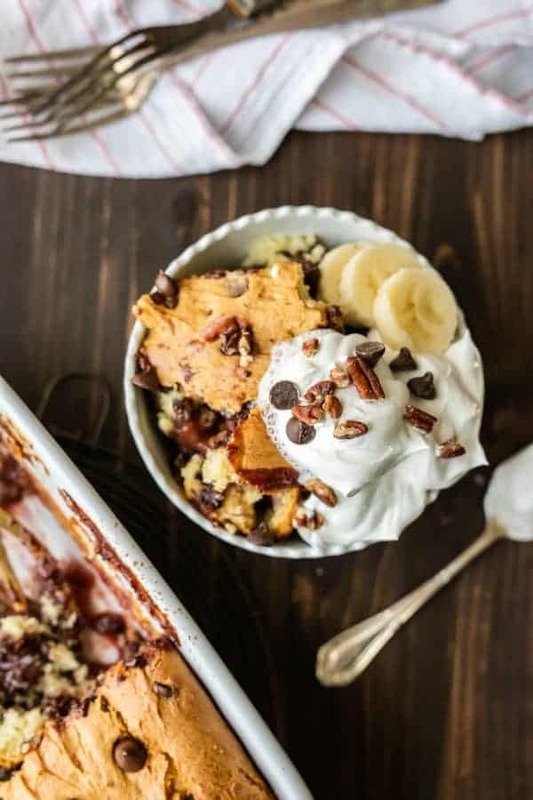 Banana Split Dump Cake is the best dessert ever! 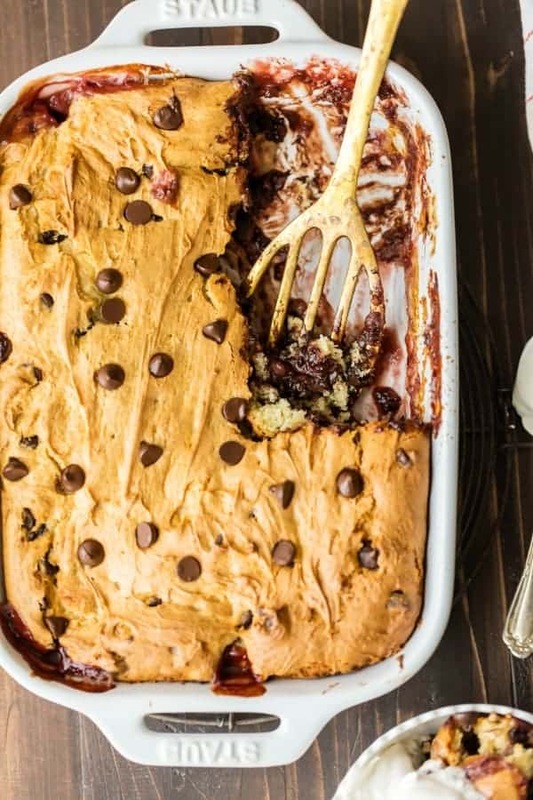 This dump cake is thrown together in minutes with just 6 ingredients and is sure to be an instant crowd pleaser! Let’s be honest, how many of us have time to cook every single recipe from scratch? Sure, there are always those one-of-a-kind chocolate chip cookie, bundt cake, or pie crust recipes that HAVE to be followed word for word and passed down through generations, but sometimes simple recipes made quickly with store-bought ingredients are the perfect fix for your sweet tooth! 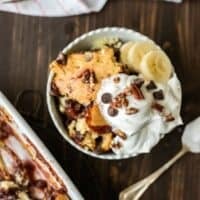 I have a soft spot for dump cakes, and this Banana Split Dump Cake is my personal favorite! Banana Split Dump Cake is BEYOND easy, thrown together in minutes, and sure to please. 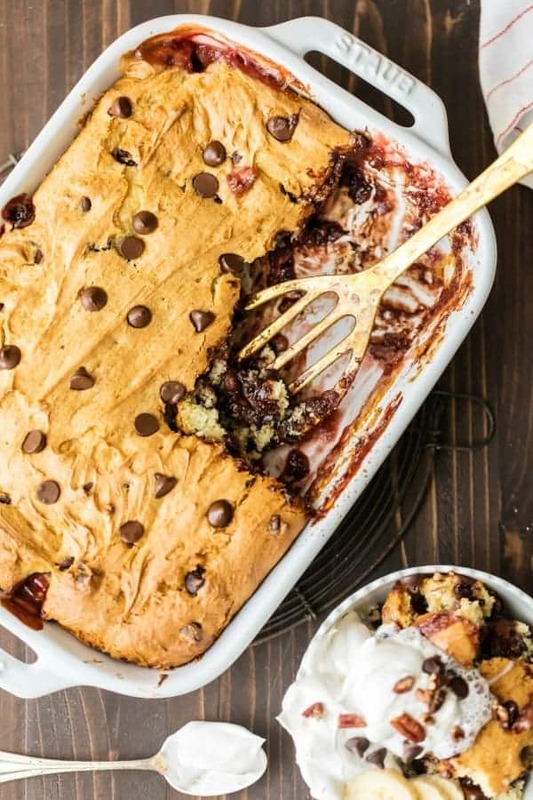 Just like Cake Mix Cookies, Strawberry Cookies or Doctored Cake Mix, this Banana Split Dump Cake is proof that great things can start with a cake mix. It’s gobbled up at parties, family get-togethers, or even just a Wednesday night in with my husband. It doesn’t get easier or more delicious than this! 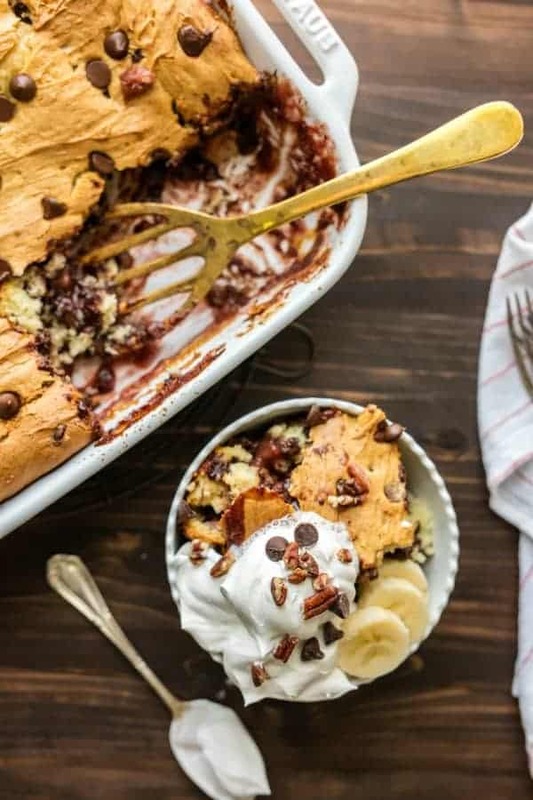 The secret ingredient to keeping this Banana Split Dump Cake super moist and delicious is Banana Cream instant pudding!! Mixed with white cake mix, it’s the perfect flavor combo. Not too sweet, not too bland, SO EASY. What more could we ask for from a dessert?! I crave this sweet treat year round. Luckily for us, Banana Split Dump Cake only has 8 ingredients and has about 10 minutes of prep time. Win, win! The bottom layer is a mix of fresh strawberries, pineapple, and banana. Just chop or slice up each fruit before combining with a bit of sugar and adding to the baking dish. All you have to do next is mix the cake mix with the pudding and some good quality chocolate chips. That’s right; we can’t forget the chocolate in our Banana Split Dump Cake! Spread this mixture over the fruit and bake. 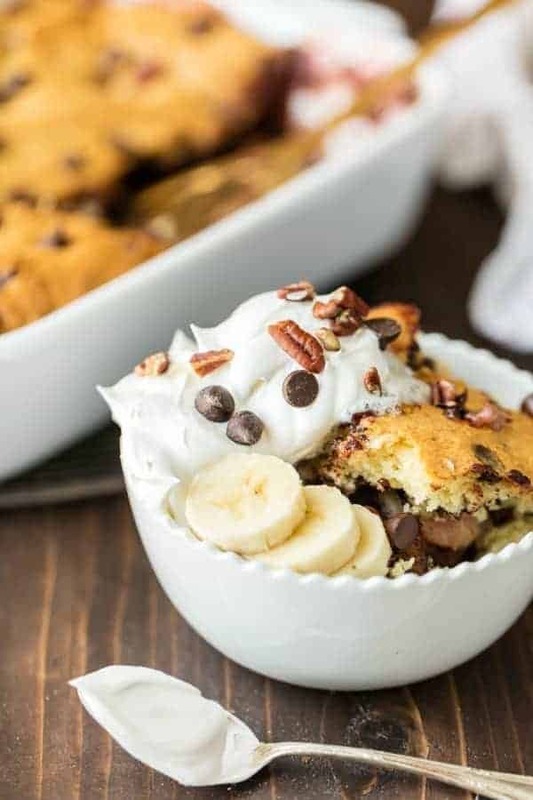 Try serving Banana Split Dump Cake with whipped cream, chopped nuts, sliced banana, or any of your other favorite banana split toppings. Each bite tastes like a fun and fresh banana split, in cake form. Fun baking at its finest! This is such a great dessert to take to a potluck, because you’ll look like a total star and people will eat it up immediately. You don’t have to tell them it’s made with cake mix! It can be our little secret. Banana Split Dump Cake was contributed by Becky of The Cookie Rookie. Banana Split Dump Cake is the best dessert ever!! 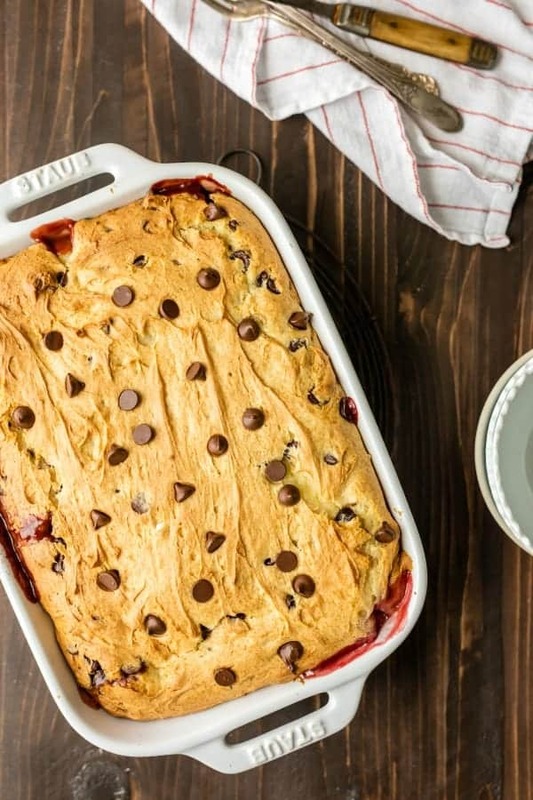 This dump cake is thrown together in minutes with just 6 ingredients and is sure to be an instant crowd pleaser! Spray a 9/13 inch baking dish with nonstick spray. In a large bowl, mix the pudding mix with milk. Whisk until fully combined. Use a large spoon or whisk to add in the cake mix until fully incorporated and smooth. The mixture will be quite thick, which is fine. Stir in the chocolate chips. Set aside. In another large bowl, mix together the strawberries, banana, pineapple, and sugar. Stir to combine and let macerate for at least 5 minutes. When ready to make the cake, pour the fruit into the bottom of the baking dish, making a thin layer. Top with the cake mix and spread with a spatula or spoon to create a smooth top. Bake for 45-60 minutes or until the cake is completely cooked through (when a toothpick inserted in comes out clean). Serve warm topped with fresh whipped cream. So happy to hear you enjoyed the recipe, Samantha! Thanks so much for stopping by and leaving your feedback! What a great use of the cake mix that’s been sitting in my kitchen cabinets. These flavors are amazing. Thank you for a great recipe. So happy to hear you enjoyed the cake, Alyssa! Thanks so much for stopping by and leaving your feedback!